This post was co-authored by Shakuntala Makhijani and Lorne Stockman. Oil, gas, and coal prices all fell dramatically in 2014, but North American fossil fuel industry* profits still totaled a healthy $257 billion. 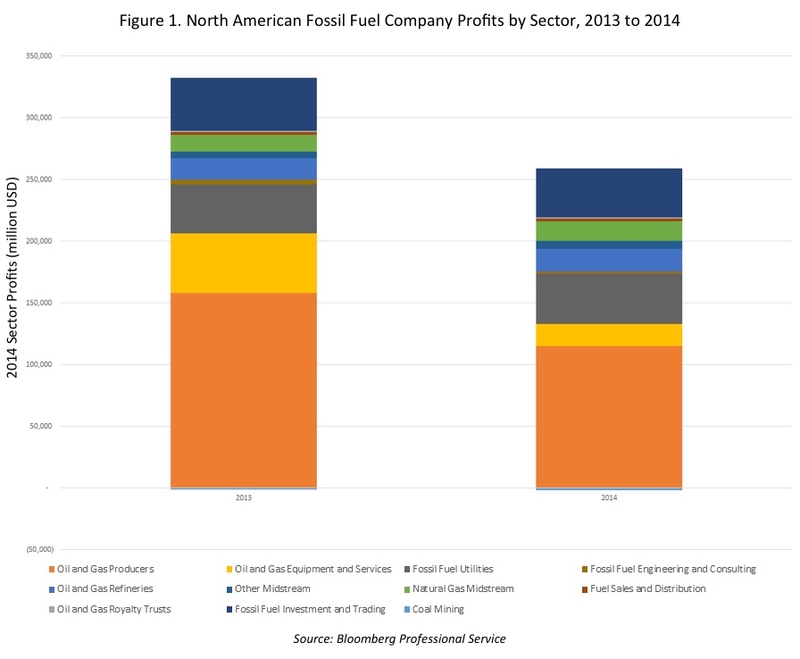 These profits were a modest 22% less than 2013, with the declines unsurprisingly concentrated in the upstream fossil fuel industry. The coal mining companies in our survey collectively posted losses of $1.8 billion. This was about $600 million more than they lost in 2013 but an improvement on the $3.6 billion lost in 2012. Trading companies were the only other sector to post a loss at around $250 million. North American oil and gas exploration and production companies made $115 billion, down 27% from 2013. Given that prices are down around 50% for oil and around 40% for gas, the profit declines are perhaps less dramatic than expected. Oil and gas equipment and services and fossil fuel engineering and consulting companies also experienced significant declines of more than 60%, reflecting the decline in active drilling rigs and other project delays and cancellations. While 2014 will certainly be remembered as a tumultuous year for fossil fuels it remains to be seen how this period of falling prices will impact the sector’s future. Coal certainly appears on the retreat with many mining companies losing money year after year. But the oil and gas sector is a different story and the coming period may be marked by rationalization (mergers etc. ), cost cutting and potentially higher demand stimulated by low oil prices. Anyone looking to strike a death knell for the sector had best look toward emerging disruptive technologies and much more aggressive climate policy before reaching for the clapper. *North American fossil fuel companies include many foreign companies – like Shell and BP – that, although they do not earn the majority of their profits in North America, are major players in American and Canadian oil, gas and coal industries. Profits from major Chinese companies, including PetroChina and China National Petroleum Corporation, were not included despite their significant interests in Canadian tar sands because to date their North American activities make up a tiny share of their total profits.